FilmTech Carpet Protection 24" x 50' is for temporary use only. Countertop Protection Film 24" x 500' is available in different colors. 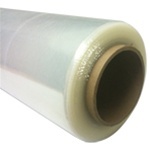 Plastic Sheeting 10" x 25' Clear is a general purpose poly sheeting ideal for use in painting, plastering and stucco applications.